© Adrian Dennis/AFP At the Myanmar Embassy in London on Sept. 27, 2018. Jamal Khashoggi gave us a road map for making sure he did not vanish in vain. His journalistic colleagues, along with freedom-loving people of any profession, need to make sure that doesn’t happen again. No help appears to be forthcoming from President Donald Trump. As a candidate, he had no hesitation about declaring the entire nation of Mexico “drug dealers, criminals and rapists” on his own say-so. He early and often questioned his predecessor’s birthplace despite clear proof that he was peddling untruths. But now, the brash defier of political correctness has turned punctilious: In the face of mounting evidence that Saudi Arabia is implicated in the murder of a U.S. resident, the president frets about a rush to judgment. Other American leaders, however, are stepping up and speaking out. Members of Congress, including members of Trump’s party, are expressing their horror in unvarnished terms and promising reprisals. “I can’t imagine that if what we think happened that we would take no action,” Senate Majority Leader Mitch McConnell, R-Ky., told Bloomberg. U.S. business leaders are boycotting a Saudi investment conference. At least three blue-chip Washington lobbying firms — Glover Park, Harbour and BGR — have reportedly severed ties with the Saudis. (OK, that’s just three Saudi lobbyists down and 63 to go — and one of those three might have been inspired to do the right thing by an ultimatum. But it’s a start). To borrow a term popularized by former President George H.W. Bush, these are points of light — signs that in at least some quarters, Americans are remembering what truly makes this country great: Its ideals. Not its military contracts. The momentum toward decency needs to build. As Khashoggi warned, silence in the face of evil equals consent. Impunity for thugs begets more thugs. And Khashoggi’s disappearance was not an isolated incident. 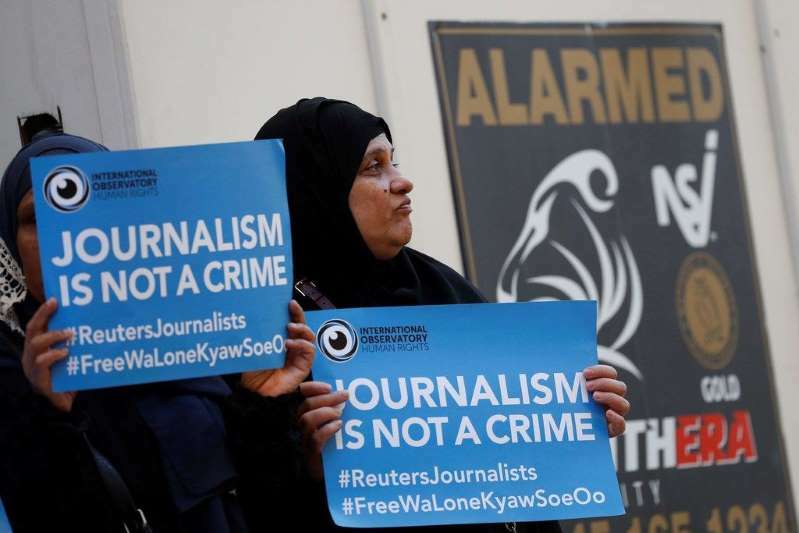 It is just the latest in a series of horrific crimes against journalists. The government of Turkish President Recep Tayyip Erdogan, which has accused the Saudis of murdering Khashoggi in Istanbul, is certainly not doing so out of love for freedom of the press: Under Erdogan’s leadership, Turkey has become the world’s No. 1 jailer of journalists. And let’s not forget that Erdogan’s thugs attacked protesters and the reporters covering them on U.S. soil. In this country, Immigration and Customs Enforcement officials continue to push for the deportation of Emilio Gutiérrez-Soto, a law abiding Mexican journalist who sought asylum here when his reporting on official corruption in his country made him the target of death threats. There’s a global war going on, and it’s not just against journalists. It’s against what journalists represent: free speech. Americans have always had a healthy resentment of elites. President Trump rode that into power in 2016. Around the world, we now are seeing where unchecked elitism can lead: to dictatorial oligarchies run by governments or criminal cartels whose leaders think that their oil or their drugs or their power gives them the right to play by a different set of rules than those that apply to the rest of us. Journalists make a living from calling out that kind of entitlement, and now they are getting killed for it. It’s time for Americans to decide, and to ask their leaders to declare: Which side are you on?